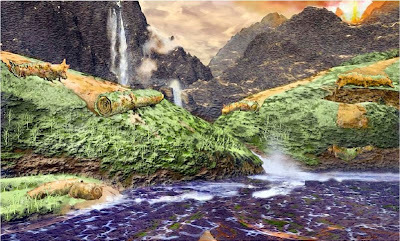 Catalogue of Organisms: Prototaxites: A Giant that Never Was? Reconstruction of Prototaxites as columnar perrenial fungus from Hueber (2001), painted by Mary Parrish. Nearly two years ago, I presented a post on Prototaxites, a mysterious fossil of the late Silurian, the earliest truly large terrestrial organism known from the fossil record. In that post (which I'd recommend reading before this one) I discussed the possibility that Prototaxites might have represented a giant fungus but a recent publication by Graham et al. (2010) presents a new alternative interpretation of Prototaxites. If they are correct, the Silurian may never be the same again. Thalli of the liverwort Marchantia. Photo from here. In Graham et al. 's estimation, Prototaxites should not be classed with the fungi but with the liverworts. 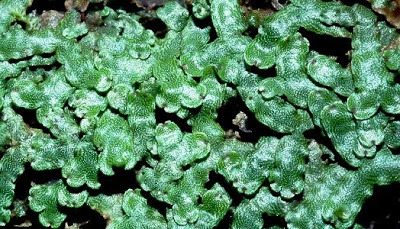 Liverworts are small, often mosslike plants of moist habitats. Members of one group of liverworts, the thallose liverworts, lack any distinction between leaves and stem but grow as a flattened thallus anchored to the ground by rhizoids (rootlets) on the lower surface. Liverworts are one of the earliest diverging groups of land plants and they or their ancestors would have certainly been part of the Silurian flora. One group of Silurian plant fossils, the nematophytes, possess a microstructure of criscrossing tubular filaments; Graham et al. (2004) demonstrated that this structure was also found in the decaying remains of modern thallose liverworts, as the upper tissue of the thallus rotted away to leave the more resistant rhizoids and connective tissue. The microstructure of Prototaxites is also similar to that of nematophytes, to the extent that some palaeontologists have regarded nematophytes as Prototaxites leaves (this interpretation is not currently supported as nematophytes have never been found actually attached to Prototaxites). But modern liverworts lack strong supporting tissue and would be pushing to reach an inch in height - how could they have produced the eight-metre columns recorded for Prototaxites? 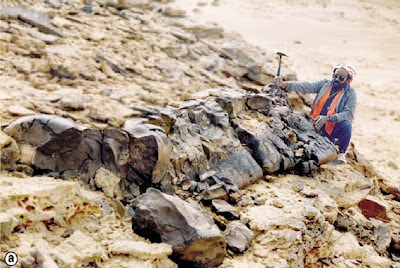 The largest known Prototaxites fossil (at least as of 2001), photographed by Charles Meissner in Saudi Arabia. From Hueber (2001). A transverse section of Prototaxites shows a ring structure like that found in a tree trunk. Hueber (2001), who interpreted Prototaxites as a perennial fungal fruiting body, felt that this ring structure also resembled tree rings in indicating discontinuous growth by the organism. Graham et al. (2010) interpret the ring structure differently. They suggest that large mats of thallose liverworts covered the Silurian landscape. These mats could become detached from their substrate by agents such as wind and rain, and start to roll up as they decayed. As they rolled, they would form the large columns that, after being compressed by burial and fossilised, would eventually be identified as Prototaxites. Reconstruction by Kandis Elliot of Silurian liverwort mats being rolled by wind, gravity and/or water movement to form 'Prototaxites'. From Graham et al. (2010). Under this interpretation of Prototaxites, the fungal hyphal structures identified by Hueber (2001) within Prototaxites sections would be those of fungi growing among the liverwort mats. Boyce et al. (2007) identified significant variations in carbon isotope ratios between Prototaxites individuals as supportive of fungal identification because they suggested heterotrophy (nutrients being obtained from the surrounding environment rather than being produced by the organism itself); however, Graham et al. (2010) establish that thallose liverworts may grow heterotrophically when conditions encourage it. The liverwort interpretation is also more consistent with the size of most Prototaxites filaments (much larger than found in modern fungi) and also explains the occasional discovery of other land plants embedded in Prototaxites columns - these would have been growing among the mats and become swept up when the mats became rolled, like Silurian Cleopatras. I find this new interpretation intriguing, if a little difficult to accept outright. Prototaxites is represented by a reasonable number of specimens (I don't know the actual number, but thirteen species have been named from numerous localities around the world) - were the conditions that would have lead to mat-rolling common enough to have produced that number of fossils? I wonder if it would be worth investigating how Prototaxites specimens compare in abundance to nematophyte specimens and what that might tell us about the likelihood of 'Prototaxites' formation from liverwort mats. Certainly, the only thing that could be more intriguing than the existence of these giant pillars from so early in the earth's history would be if it turned out that they never existed at all. Boyce, C. K., C. L. Hotton, M. L. Fogel, G. D. Cody, R. M. Hazen, A. H. Knoll & F. M. Hueber. 2007. Devonian landscape heterogeneity recorded by a giant fungus. Geology 35: 399–402. Graham, L. E., M. E. Cook, D. T. Hanson, K. B. Pigg & J. M. Graham. 2010. Structural, physiological, and stable carbon isotopic evidence that the enigmatic Paleozoic fossil Prototaxites formed from rolled liverwort mats. American Journal of Botany 97 (2): 268-275. Graham, L. E., L. W. Wilcox, M. E. Cook & P. G. Gensel. 2004. Resistant tissues of modern marchantioid liverworts resemble enigmatic Early Paleozoic microfossils. Proceedings of the National Academy of Sciences of the USA 101 (30): 11025-11029. Hueber, F. M. 2001. Rotted wood–alga–fungus: the history and life of Prototaxites Dawson 1859. Review of Palaeobotany and Palynology 116 (1-2): 123-158. So these strange towering organisms might actually have been sheets of groundcover plants that got rolled up like carpets before they were fossilized? That's a really good example of how difficult it can be to interpret fossils! If they are rolled, the ring structure should show a spiral pattern. This should be discernible with careful observation. Alternatively, a mathematical analysis of a photograph of a cross section could be done, in which a photo is superimposed with its own mirror image, and then the average angle between co-located linear surface microfeatures would tell the tale. The angle should be zero for rings, nonzero for a spiral, and it may be that differences too subtle to see by visual inspection could be definitely established by this method. If they are rolled, the ring structure should show a spiral pattern. That's a very good point. It would require an entire well-preserved cross-section to fully establish this one way or another, and I don't know whether such an ideal specimen is available for Prototaxites, but it is at least hypothetically determinable. One other possibility that occurred to me would be a clincher fossil would be if a specimen was found that had for whatever reason started rolling from two different directions, giving rise to two columns lying side by side but connected like a scroll. The "occasional discovery of other land plants embedded in Prototaxites columns" seems a pretty convincing piece of evidence to me. Apparently, you are not convinced. Is there any alternative explanation how these plants could have gotten there that you know of? An artefact of the fossilisation process perhaps? If I remember correctly, Hueber (under the giant fungus model) believed that the fungus had overgrown the plants while absorbing nutrients from them. It's also possible that the plants were themselves growing over the Prototaxites individual and were engulfed when the organism resumed growth itself. I was thinking about the rolling, and another indicator would be "loops" or folds in the roll. when I have rolled up carpets, or observed large flat flexible objects like cloth rolled by the wind, they have a tendency to flop about. They don't roll tightly unless something or someone is holding them in place. So I'd also look for "S" shapes and "U" shapes in the rings where the rolling was floppy. Also the inclusions of other species should be found more often in those loops. I assume that rounded tops as featured in reconstructions haven't actually been found? If they were they'd seem to confirm the columnar growth model. Similarly for bases. Wouldn't it be rather odd, on the columnar model, if lots of bits of the middle part of the growth has been found but no stumps? I don't know if any Prototaxites fossils have been found with the top clearly intact - I suspect not. Apparently a number of specimens do show a broadening towards the base. (But then, how would the researchers have identified the base? As the end towards which the column broadens.) I suspect that the vast majority of Prototaxites specimens have been found in bits, which would hardly be surprising - it's the sodding Silurian, you can't get much older than that (at least, not terrestrially). There's probably been a fair amount of diagenetic alteration of specimens since then as well. But then, I've just thought of another problem with the fungal model - wouldn't fungal columns lack a decent rooting system? Wouldn't they be rather prone to collapse in storms, for instance? 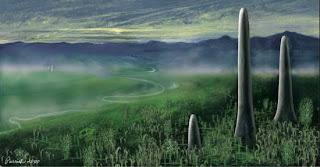 And without any high vegetation cover, the Silurian probably saw some doozies of storms. That's the problem I'm having with the idea as well - it just seems too predicated on too many environmental conditions. But at the same time, there's no denying that things were very different in the Silurian. The Graham et al. paper refers to records of liverwort mats covering an area of several acres, so they can cover a very large area if conditions permit. One of the major limiting factors in the modern environment would be competition for space with other plants - trees, shrubs, etc. In the Silurian, there were no trees and shrubs; mostly there would have been only other bryophyte-grade taxa. Even the few stem-tracheophytes in the area weren't much more than uppity bryophytes, so there's little to prevent formation of mile upon mile of bryophyte-grade cover. 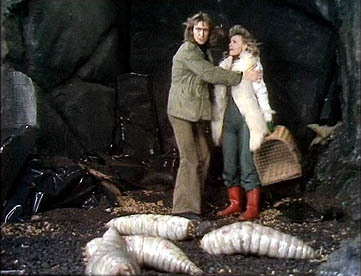 I've got no real idea what weather conditions were like in the Silurian but, as I mentioned in an earlier comment, I'm certain that the absence of any high vegetation would have made some difference. What sort of wind conditions can develop when the only windbreaks are hills and mountains? Wouldn't they likely be comparable to wind conditions in unvegetated areas of modern Earth -- e.g. driest deserts, salt flats, ice caps? Certainly I've been in some arid areas where the wind has been pretty constant. On the other hand, all modern unvegetated regions are in arid areas, and there's no reason for the air above liverwort mats to be arid. Maybe you're thinking too literally as to the nature of liverwort mats. Instead think of other sorts of obviously more advanced plants of today take advantage of their growing season, wind, like tumbleweeds. During the wet season tumbleweeds sprout, grow fast to take advantage of the wet season in the semi-arid regions they live. By the time the dry season arrives the plant is ready and top heavy with seeds ready to be spread. Quickly the root drys out and it breaks releasing the tumbleweed to blow in the wind and spread its seeds. While liverworts don't have seeds to spread they do have their spores which would have needed space on the ground to sprout and start the next generation, but they have to wait until the growing season is over, and the dry season sets everything up for the next generation to grow. Being liverworts, it wouldn't take very long for the dry season winds to desiccate all the many acres of liverworts and other primitive plants with no way to prevent it. Once dried enough, even light winds with an occasional strong gust to get things going would probably be able to lift them up off the ground it's much easier to imagine the wind rolling them up. The rolling up also conveniently clearing the ground for next season's growth. The notion of strong winds ripping up vital, very green liverworts during the growing season requires a much more complex set up. Simply factoring in a wet season/dry season semi-arid climate modeled on the ones we have today brings all the factors necessary together to make this theory sound very sensible. I'm sure as you know most such climates feature hot dry winds sometime during the year. As for the rolls, even though they were dessicated, they still had some moisture in them, far more than the surrounding area during the dry season, enough for fungus to grow within them and prevent them from being completely dried out and easily destroyed completely without a trace. I'm hardly an expert, but the columnar model has been bothering me for selection based reasons. Modern fungi reproduce via very small and light spores, which are very easy for wind to disperse, hence height is of small advantage. Fungi do not need light for photosynthesis, so again, height is no advantage. Further, saprophytes get most nutrients from their substrate (or perhaps from airborne matter), so a tall columnar shape is the very opposite of an efficient feeding shape for fungi. What conceivable selection pressure could drive the evolution of such columns then? The differences would be significant. Under one model, the organism is an autotroph that is able to generate its own nutrients; under the other, it is a saprotroph, entirely dependent on nutrients already present in the environment. Also, there could be effects from factors such as rooting, wind exposure, etc. I wonder if anyone has considered the possibility that these structures were formed in a way similar to stromatolites (but of non-vascular land plants, rather than algal mats)? If they were, there would be no reason for them to have grown as a narrow column. Stromatolites form as mats of cyanobacteria overgrow themselves (and the sand that becomes trapped on them) in order to maintain exposure to sunlight. But Prototaxites (if upright) was more than eight times as tall as its nearest competitor, and several orders of magnitude taller than most other contemporaries. Complete overkill if light exposure is the aim. On the other hand, the fungal model is somewhat more comparable, in that it would involve successive years of growth overlaying each other. Though that also raises a question that is potentially relevant here: are there any 'juvenile' Prototaxites known? Fungi do not need light for photosynthesis, so again, height is no advantage. I thought the idea was that (despite the lack of other evidence) Prototaxites was a lichen, so it would have needed light? Anyway, I find it very easy to imagine that a decent rainstorm could detach a liverwort mat from a slope and send it slumping or rolling. Under Silurian conditions, only aridity (or perhaps diseases) could stop a liverwort mat from covering all dry land. I think most of the Prototaxites-as-fungus reconstructions I've come across have compared it to a bracket fungus (so it would be a perennial fruiting body), not a lichen. Nice to see this debate is still going on after all this time. It's been rumbling about in my brain since I heard about these things a few months ago. It feels like an appropriately slow rate of development. I was trying to think of analogous modern organisms and the Saguaro cacti were the obvious candidates. I'm not sure if these evolved their form originally to compete with other tall vegetation (ie trees) or for some other reason, but a columnar lichen - steadily adding layers each wet season, forming a tough fibrous 'trunk' (incorporating epiphytes as it goes) suddenly seems a lot more plausible. Tree-fern caudices would be another parallel. I imagine the hyphae/rhizoids/novel root-like structures evolving to be as substantial as the upright part (like the wide root-plates of the cacti - absorbing dew and cloudbursts quickly over a wide area) I'm also imagining fruiting bodies forming seasonally (as cactus flowers do) on the upper part of the column. My only problem is what the immature specimens would look like. Cacti first expand to the the full diameter close to ground level and only then go up - hence no growth rings. Protaxites would have to start as a sapling. Sorry, Andreas, your comment went into the site's span filter and I've only just noticed that it needed to be freed. 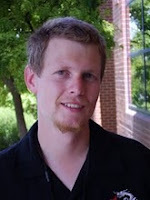 Thanks Andreas - the AmJBot article seems to neatly get shot of the lichen mats hypothesis. Extra height in 'plants' btw doesn't have to be about photosynthesis. It can also be about avoiding predators or competitors, or spore/seed dispersal. Our thought experiments so far seem to have imagined a rather boring, lunar landscape with nothing but a 2 dimensional flora of lichens, liverworts and maybe algae (indeed the lichen mats hypothesis depends on such a flat barren species-poor environment for its plausibility) but there's nothing to say there wasn't a dense and diverse community of something resembling mosses or charophytes possibly of considerable depth - especially in wet and sheltered sites - gullies, wet seeps or tidal marshes, perhaps forming a thick peaty soil in some places. There could have been epiphytes and climbers, and all manner of semi-terrestrial molluscs, arthropods and worms (and fish - why not? There are tiny catfish, gobies and eels that spend considerable amounts of time crawling about among wet litter and moss along the edges of streams and swamps these days.) All this is speculation of course, and I doubt the fossil record will help with such a boneless, lignin-free biota, but it seems to me that it might nevertheless help to visualise Protaxites in a much richer and more varied ecosystem than we have been, to really understand the possibilities. I am an artist painting mainly scientific illustrations and I was about to do a painting of these enigmatic organisms. I have read this topic with interest and I have to say Steve Law paints a very persuative argument that fits with my thinking. I happened to Google for Prototaxites images and was amazed how few there were (though not surprising of course, as not enough is know about them). I proposed a painting of an area of boggy tidal shoreline biota with animal life eg arthropods mollucs etc. So what would you like to see on this painting I propose? (Be aware that my painting is of course my own copyright) I just thought you'd be interested to see how I would develope into something we all can visualise. Hi again Richard. I assume you got my email. For readers of this forum I said "I can't tell you what to put in your picture. My comment was purely speculative. I'm always intrigued by the twin thoughts that the speed of evolution is so vastly underestimated by most people (and the time spans so enormous), and that fossilisation is so vanishingly unlikely, and therefore we can have absolutely no knowledge of almost all of what must have been there. Your picture, if you use my ideas, must be almost total science fiction." I've been thinking about your project some more though. I assume you've had a look at a comprehensive inventory of fossils from the period to give you as many ideas as possible. My understanding (which may well be out of date now) is that most of the modern phyla were already there in the Cambrian - molluscs, arthropods, chordates, cnidaria etc etc but not in their familiar modern forms. For example, I understand that what we think of as typical molluscs (snails, clams and squid for example) didn't evolve until much later. Back then, the molluscs might have been more closely related to the segmented chitons for example, which might have occupied a much broader range of niches (huge carnivorous freshwater chitons? Planktonic swimming chitons? Shell-less slug-like chitons? Who can say?) plus there would also almost certainly have been other groups of molluscs that are completely extinct now, occupying the niches of modern molluscs and just as diverse in form (though presumably we'd have some fossil evidence of shelled animals so maybe this is not a good example). Remember that scaley limpet-like Burgess Shale animal? Even worse, a lot of the niches occupied by modern molluscs were probably occupied by completely unrelated organisms which may be all but extinct now. An obvious later example is the brachiopods. There are quite a few extant small obscure groups, such as the Priapulids which were almost certainly much more important back then, and others, like the graptolites and conodonts that we know almost nothing about now, but which would also have been representatives of huge diverse groups. And there will be other groups, whole phyla even, of which there is not a trace now. This would have been true for all the groups, plants, animals, fungi and microbes. Even so, my guess is that a lot of the niches would have been similar and a lot of the forms taken to fill them would have been familiar, so there would, in your scenario, almost certainly have been some sort of worm-like organisms, slug and limpet-like organisms, sessile bryzoan/sponge-like organisms, finned fish-like organisms and shrimp or centipede-like arthropods of some sort. So you can go ahead and paint some of these and I think, stand a fair chance of being right. (Yes I got my email thanks). Thanks also for thinking about my project. To readers of this foram, I am currently thinking of creating a scene containing some Prototaxites (very few images of these organisms have been shown, no doubt due to lack of information). I am sorely tempted to paint clumps of them growing rather than isolated ones, possibly some fallen ones being consumed etc. I am painfully aware of the balance between fanciful scene & academic, due to lack of references. I do like Steves idea of having some aquatic animals foraging briefly on the land . Anyway, the idea is to show a scene with a rising sun, lakes etc dots the land, show clumps of Prototaxites amongst the morning mist with perhaps some sign of animal life on the water margins. Perhaps have the lower part of Protoaxite being consumed, showing some damage, leaving the tops untouched due to their great heights. Do you think this'll work? My burning question is do you think it is acceptable to paint them in clumps? Steve, Richard - sorry about being slow replying, I was trying (largely unsuccessfully) to look up some further details. In response to Taylor et al. 's critique of the rolled liverwort proposal, be sure to read Graham et al. 's counter-response (http://www.amjbot.org/content/97/7/1079.abstract). At the very least, if Prototaxites did indeed grow as a single column, it did not grow in the same manner as a modern tree, because the growth rings are not as evenly concentric. Known Prototaxites specimens appear to have largely been subject to transportation before burial, so we don't seem to have any direct evidence of the growth environment. I don't think that bryophyte mats are incapable of forming complex environments, but I suspect that it's likely to be soil-based rather than aerial. As regards the animals to be found in such an environment: first off, I don't think that there is any evidence of terrestrial molluscs until some time later (feel free to correct me if I'm wrong). Molluscs, even from that long ago, have a relatively high preservation potential, so an apparent absence is likely to correspond to an actual absence. Shell-less molluscs like slugs, of course, have less of a fossil record (if any), but it seems very unlikely that terrestrial slugs would have evolved when terrestrial snails (for which, having shells, desiccation in the terrestrial environment is less of a problem) had not. What we do have direct evidence for at the time is arthropods, particularly euthycarcinoids. I think it most likely that any Silurian terrestrial animals, like euthycarcinoids, are likely to be amphibious: mostly aquatic, but making forays out of the water for feeding/breeding/etc. Kind of like hippos. I think what I will do is to carry on with the painting. When done, I'll show it to you all. You can then critique it. I've sketched it and it is just so bizarre seeing these towering structures, it looks science fiction. I tell myself to look'outside the box' and try and base it on what information we have. Please have a look at my new painting, and I shall be interested in your comments. I decided to keep it fairly simple, but yet atmospheric. Looks nice, Richard. Could I use it for a post here? Hi Chris, yes that's fine, thanks. Hi Chris,tried emailing you, but came back as undeliverable. It was the email address I found in your HomePage. The address is at the top right of this screen: gerarus at westnet.com.au. Nice - it's a wonderfully surreal and atmospheric landscape. Just noticed i've been miss-spelling Prototaxites up until now. Oops. Just a few thoughts on a long dead post. You might be able to think of Prototaxities as a saguaro. Some people commented that the large winds of the Silurian would have blown over a structure like Prototaxities. Saguaros are often found in windy conditions and have no taproot, but a large branching root system that radiates almost instantly once in the ground. If Prototaxities was a fungus it could be similar, with branching hyphae spreading across the marshes to feed on decaying matter but no deep taproot. The immense height of the structure might not be so much as something that was a deliberate advantage over the early plants, but a effect of its growth. Prototaxities could have taken hundreds of years to grow, slowly adding cells to the (already mature?) fruiting body (it's not like it going to think, Oh, I'm tall enough, time to stop growing!). Saguaros similarly take hundreds of years to grow. The question then becomes, where are the fossils of the Prototaxites 'root' system? I've noted in a subsequent post that one group of authors has tentatively identified such a system, but it's still not conclusive. Good question, I have no idea. Maybe they were very "soft" and small, decaying in almost no time at all? It seems unlikely. Large fungi can produce quite sturdy hyphal 'roots' (rhizomorphs is the accurate term). I've been thinking about cramp balls (Daldinia concentrica) - a fungus also made up of concentric layers resembling rounded globs of charcoal and with a similar consistency. You can even use them for kindling. They're much smaller than our enigmatic fossil organisms of course and they grow on dead wood, but still... It makes you think about the diversity of fungi. Years ago, I saw a large "trunk" of Prototaxites eroded and later dug from a hillside. The "trunk" was distinctly tree-like and, in my estimation, in no way was that a rolled-up mat of anything. It was a discreet and separate entity with an integrity of its own. I made thin sections of this specimen, and the "tubes" weren't like anything from a liverwort. Neither liverwort anatomy nor Prototaxites anatomy is a mystery. While no explanation of Prototaxites has ever really made sense, that it would be balled-up liverworts makes the least sense of all to me. Prototaxites: the Silurian Enigma that just won't die! Of course this is all educated guesswork. Rather than thinking of this structure as a fleshy mushroom (unlikely) why not some sort of proto-polypore? The sturdy, thick-walled skeletal hyphae of those wood decay fungi are much more robust than mere thin-walled hype like are found in our modern day mushrooms, and certainly more robust than modern day liverworts. Even those hard, perennial structures are supported by other feeding sorts of hyphae, and those are not "woody" or easily fossilized. In other words, a fungal "support system" underground would not be likely to turn to stone over time, or leave impressions in mud. But if not photosynthetic, what the heck was this thing eating? Modern day fungi eat organic debris, and it would take an awful lot of it to make a perennial structure of this size. More on the polypore model: many polypores have perennial fruit bodies, which persist in the environment for years. Many polypores incorporate plant debris into their bodies as they grow. That would also account for the plant material that is sometimes found in these Prototaxites structures. The liverwort theory is certainly interesting. Does this actually happen in modern times? Are there examples that we can view? One problem is that cross-sections reveal some random placement of layers, not a discrete tree ring model nor a rolled spiral model. But who knows what they really were, other than a great topic for scientific speculation!? I don't think anyone has ever suggested Prototaxites as a fleshy mushroom, the polypore model has always been the way to go. And you're quite right that the feeding hyphae might not be preserved as readily as the reproductive structure, but the question raised above is whether a diffuse 'root-system' of soft hyphae would be adequate to root the structure in place. As noted elsewhere, it has been suggested that associated fossils may be Prototaxites 'roots' (actually rhizoids) but the evidence is not conclusive. Conversely, nothing like the 'liverwort rolls' exists in the modern world (as far as I know), but then nowhere in the modern world has an environment like the terrestrial Silurian. In terms of nutrient availability, I don't think we should assume a priori that there was little available organic matter to feed on. Mosses and liverworts could still be producing dense ground-covers that might provide a lot of nutrients for associated saprobes, especially if each Prototaxites individual's hyphal system covered a very large area.